Seniors Wellsley Cohen and Skyler Dela Cruz decorate the Flood Mansion's Gallery for Winter Formal on Jan. 25. The gambling-themed annual dance featured snacks, drinks, card games and a dance floor in the Reception Room. Students played casino games, danced and socialized with friends at the Winter Formal in Convent’s Main Hall on Jan. 25. 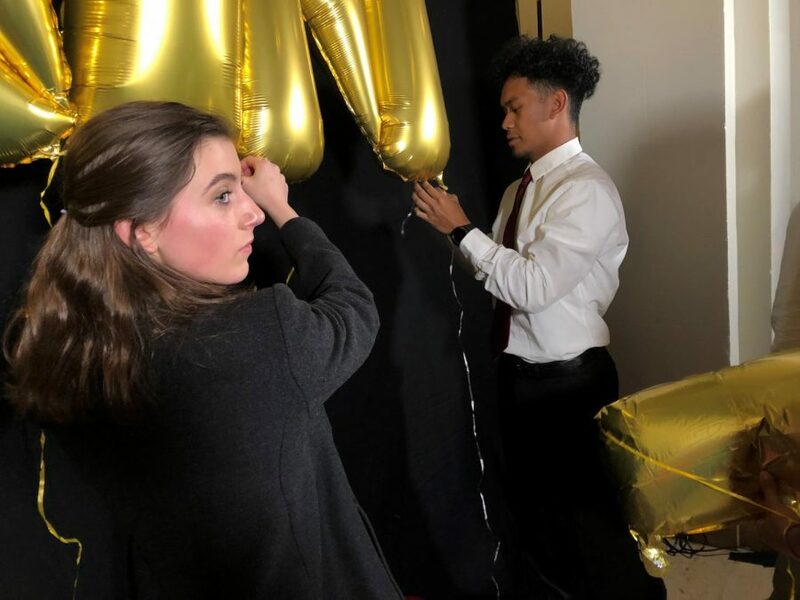 “Winter Formal is a great opportunity for everyone to mingle and relax as a community and have a good time,” Ryan Darwin ’20, Stuart Hall Spirit and Community Representative, said. Unlike other Convent & Stuart Hall dances, Winter Formal featured casino games such as poker, blackjack and roulette. The $20 admission included game tickets as well as drinks, donuts and access to the dance floor. Finals Week just prior to Winter Break necessitated having the dance in January. Attendance for Winter Formal set a new bar at 315. Whether they were playing games or dancing together, the formal gave students an opportunity to bond with peers. “Time away from school to relax and build relationships is just as important as time at and in school, so if you can mix fun and excitement with school, that’s a pretty special thing,” Darwin said.